(Newser) – Kissing a frog may not conjure a prince, but mucus from one colorful Indian variety could one day lead to new ways to fight off the flu, the Verge reports. A study published in the journal Immunity details how scientists tested secretions from an Indian frog known as Hydrophylax bahuvistara and found that one distinct peptide was able to kill certain strains of the influenza virus without simultaneously decimating human red blood cells, as well as protect mice from the H1N1 strain. That molecule, called urumin, is named after the Indian "urumi" sword that looks and acts like a whip and is found in the country's Kerala region, which is also where this particular frog hails from. The scientists involved in the study first collected mucus from the frogs by applying slight electrical shocks to them, which causes them to secrete the substance, Phys.org notes. "The scientists involved in the study first collected mucus from the frogs by applying slight electrical shocks to them, which causes them to secrete the substance, Phys.org notes." Right. Slight electrical shocks. Doing the same thing to people generally causes them to secrete a substance too, but it sure isn't mucus! So in addition to kissing that Frog you may need to slip it a little tongue? 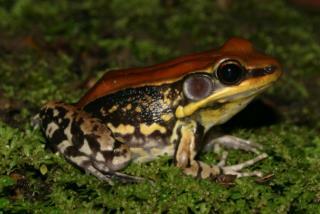 Good news for humans maybe, not so much for South Indian Amphibians.